This is a conversation between a server and a diner. Put the conversation in order. 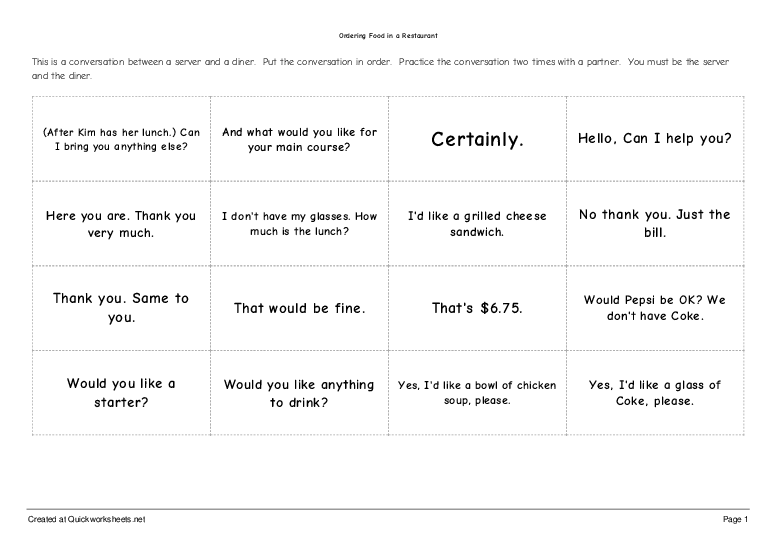 Practice the conversation two times with a partner. You must be the server and the diner. (After Kim has her lunch.) Can I bring you anything else? And what would you like for your main course? Here you are. Thank you very much. I don't have my glasses. How much is the lunch? I'd like a grilled cheese sandwich. No thank you. Just the bill. Would Pepsi be OK? We don't have Coke. Yes, I'd like a bowl of chicken soup, please. Yes, I'd like a glass of Coke, please. Yes, I'd like to have some lunch.